Early voting runs from February 18th through February 28th. Check out the Texas Secretary of State’s Vote Texas website for all the details on the March 4th primary election: http://votetexas.gov/voting/where/. 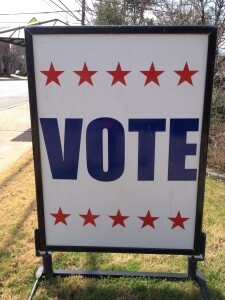 For early voting locations, go to the website of your county election administrator. You can find your county’s website from this list: http://www.sos.state.tx.us/elections/voter/links.shtml#County . Some locations are open throughout early voting and some are considered mobile sites and are only open on specific days. The great thing about early voting is that you can vote at any early voting location in the county where you reside. No long lines at your local elementary school! Don’t wait until the final day to vote in the March 4th primary election. You never know what our crazy Texas weather will look like on Election Day so vote now! We could have an alien invasion and you may not want to leave your home on Election Day so vote now!